The first official postcard was introduced by Austria in 1869, and was soon followed by a number of countries across the world. In the early years, a country had to sign individual postal treaties with each nation it wished to correspond with, a complicated system which was simplified and regularised with the establishment of the Universal Postal Union (UPU) in 1874. Early picture postcard formats carried both the picture and space for a message in front, with the back left free for the name of the addressee, the destination address, and the postage stamp. In 1903 (in Europe) and 1906-07 (United States), the UPU instituted a 'divided back' format, which remains the format used for postcards produced anywhere in the world today. The postcards in this exhibition all date from the early ‘Divided Back’ era. Picture postcards were intimately connected to the new and popular technology of photography, with most being reproduced from photographs using various mechanical methods of reproduction. There were even periods – such as between the two world wars – when photographs themselves were used as postcards as they were inexpensively and easily mass-produced. 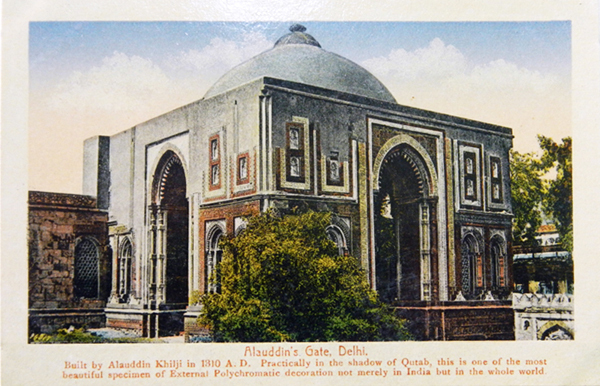 So the line between photographer and postcard-publisher was often blurred, as we find in the case of H. A. Mirza and Sons. 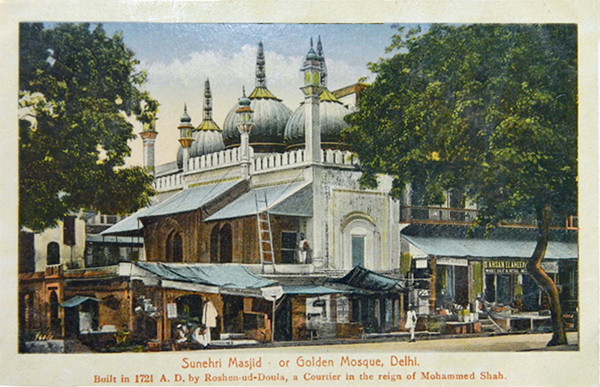 Although better known through the enormous range of picture postcards they sold, especially of pilgrimage sites in Mecca and Medina (as well as other places across Asia and South East Asia) they were first and foremost an established photographic firm based in Chandni Chowk, Shahjahanabad (Delhi) although their photographs are extremely difficult to come by. All the postcards seen in this exhibition are collotypes (also called heliotypes), printed in Germany (the major centre). A photomechanical process described as ‘half-way between lithography and photography’ it was extensively used from the mid-1850s onward and was used for commercial reproduction of images. In 2008, the photographic materials held at the Pictorial Archives of the Maharanas of Mewar (PAMM) were digitized and archived. 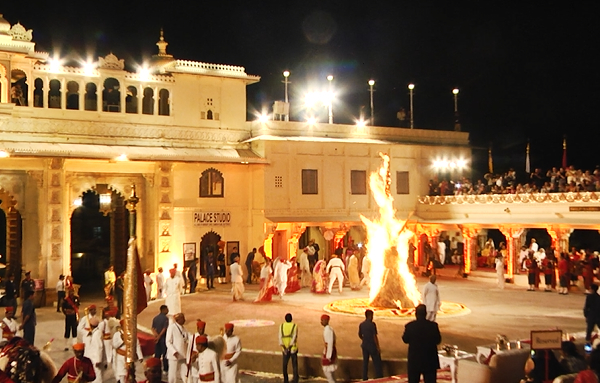 The Bhagwat Prakash Photo Gallery was established within the City Palace Museum in March 2009. It is today a centre for the dissemination of this rich holding of visual material culture with the collection being made available for research and scholarship, and through exhibitions such as these to the museum-going public and wider community. 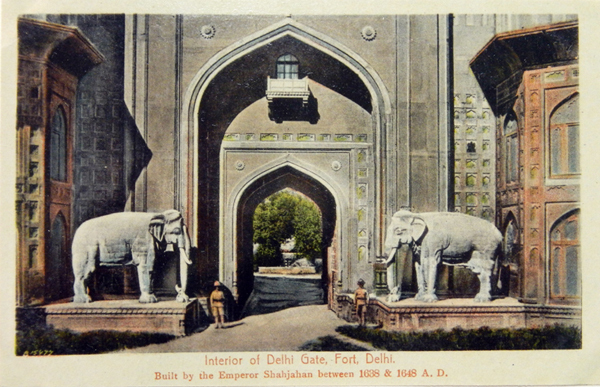 Collaterals Design: The BrandNew Co.
Also known as the Shah Mahal, the exquisite Diwan-e-khas or Hall of Private Audience was the most expensive and finest of all the buildings within the Red Fort. It alone cost Shah Jahan a staggering 14,00,000 rupees. Popularly known as Quwwat-al-Islam or Might of Islam, this is one of the oldest mosques in India. Some say it was actually meant to be Qubbat-al-Islam or the Sanctuary of Islam; the sanctuary referred to would probably be the area around the tomb shrine of the Sufi sain Qutb-ud-Din Bakhtiyar Kaki, near which the mosque stands. 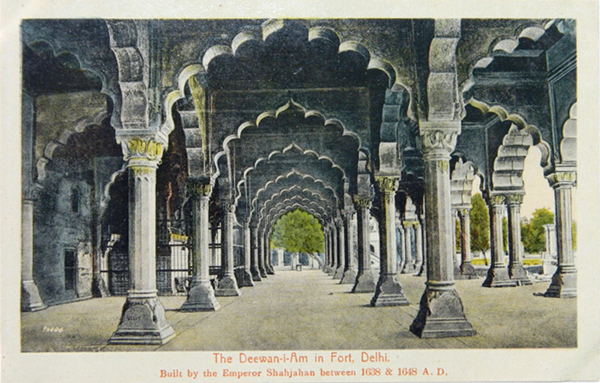 This view shows the Iron Pillar of Delhi, and part of the screen of arches built to enclose the mosque courtyard. This magnificient structure marked a significant point of change in Mughal tomb architecture. Although built for the Emperor Humayun, it served as the final resting place for a number of other members of the extended family over the centuries, and nicknamed 'the dormitory of the Mughals'. A rare, undisturbed view of the eastern gateway to the Jama Masjid, the Friday congregational mosque of Shahjahanabad. Its grand sweeping stairs, lofty dimensions and immediate entry opposite the prayer hall signal its exclusive use by the Emperor. 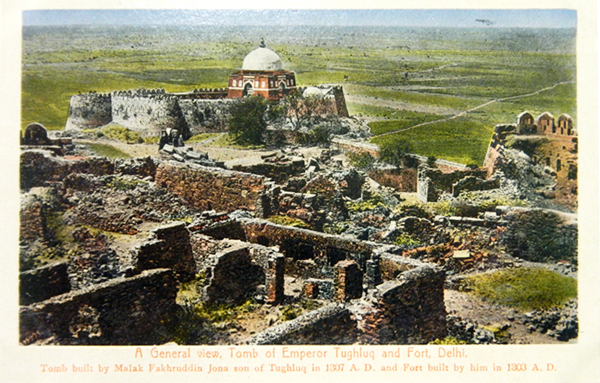 Looking across the crumbling ruins of Tughluqabad fort, the tomb of Ghiyas ud-din Tughluq was connected to the fort by a stone causeway (now bisected by a major road) and may originally have been surrounded by a lake. 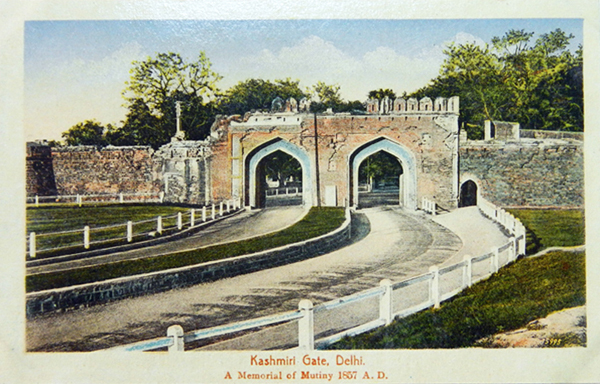 Unusual for its two arched openings, Kashmiri Gate still bears the trauma of cannon shells used by both sides in the uprising of 1857, and during which it was the site of pitched battles. 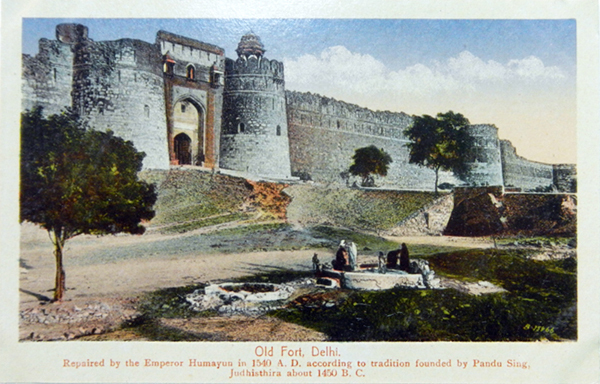 The Purana Qila (Old Fort) as it is known today, is the inner citadel of Din Panah, founded by Emperor Humayun. 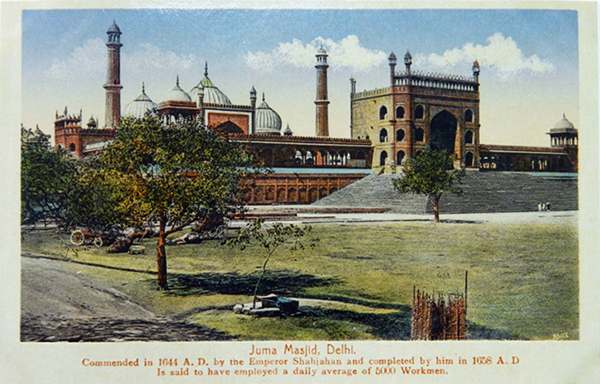 It, along with Humayun's tomb nearby, served as a refugee camp during the Partition of India. A view of the cloisters enclosing the Quwwat-ul-Islam mosque, constructed from older Hindu and Jain temples in the area. Some were certainly destroyed on the orders of Qutb-ud-Din Aibak, while others may have already been ruined. 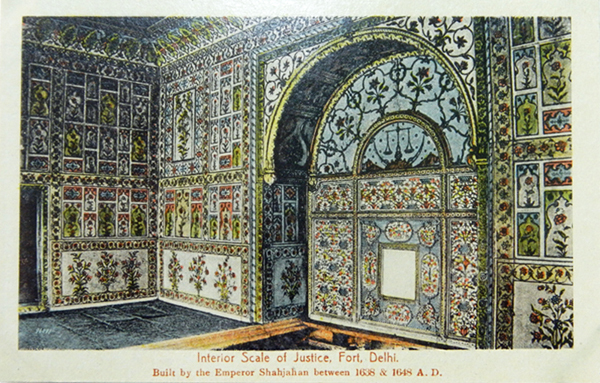 This exqusite, evocative marble screen is in the private apartments of the Emperor at the Red Fort in Delhi. The channel of the Nahr-i-Behist, a stream of flowing water drawn from the Yamuna river and designed to run through the apartments to cool them, is just visible at the bottom. 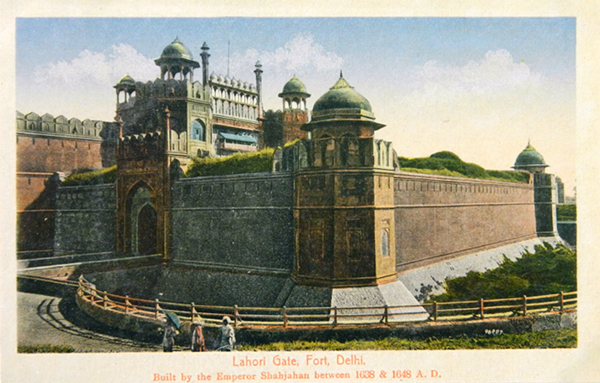 View of the Red Fort, at the heart of Emperor Shah Jahan's eponymous capital. The perspective (now difficult to manage with the city having grown much closer) allows a sense of the scale, symmetry and impact of the beautiful red sandstone facade. 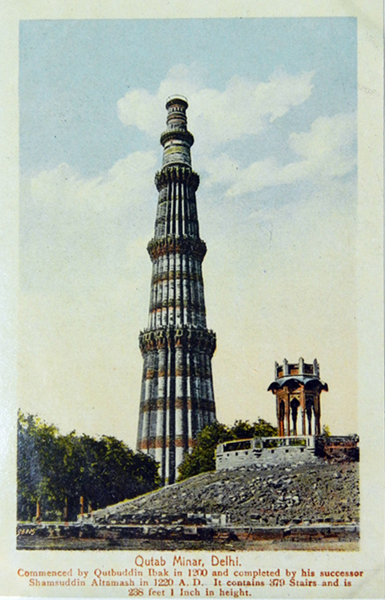 The Qutb Minar once had a cupola at its summit, which was damaged in earthquake. 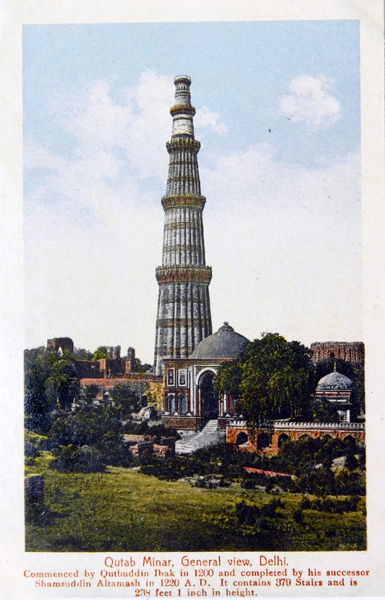 This view of the Minar also shows at bottom right the badly-matched 19th century British replacement for the lost original, which was later removed by Lord Hardinge and now stands in the grounds of the complex. 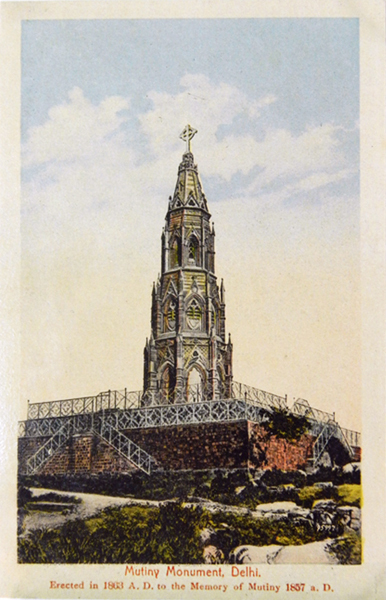 The Gothic-style tower of the Mutiny Memorial was erected by the British to commemmorate the officers and soldiers of the Delhi Field Force who were killed in action or died of wounds during the fierce battle to recapture Delhi during the troubles of 1857. Labelled a mutiny - at best a revolt - by the British the event has been reconfigured as the first war of independence by modern India. 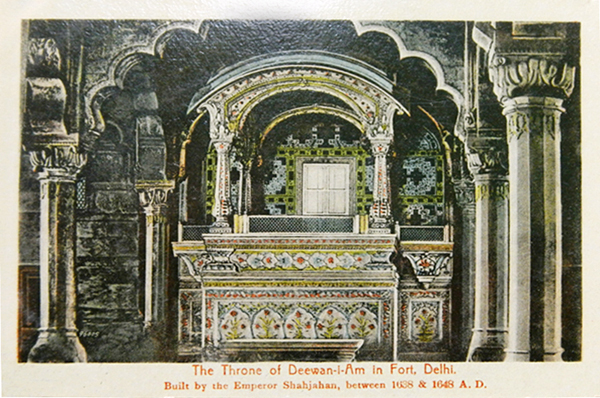 The marble throne of the Diwan-e-Am (Hall of Public Audience) is the focus of the Hall and was used by the Emperor during public occasions. The delightful ornamental pietra dura panels (of Italian origin) were originally part of a cabinet and were dismantled to be used behind the throne. 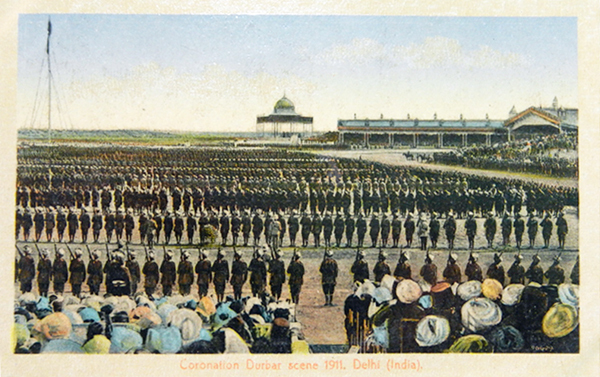 They were removed in the aftermath of 1857 and reinstated by Lord Curzon in time for the Delhi Durbar of 1903. 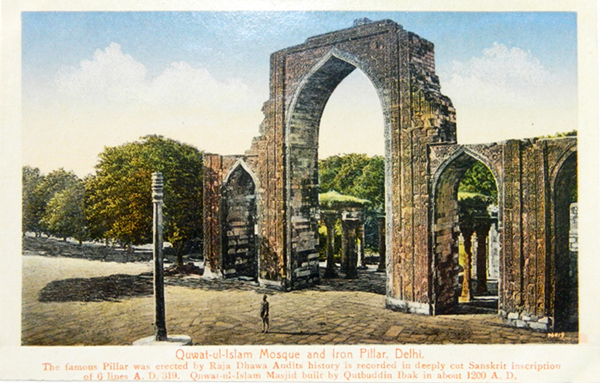 ‘Ala-ud-din Khalji was one in a long line of repairers of the Qutb Minar. He planned to enlarge the complex to double the size Iltutmish had left it, and build the ‘Ala'i Minar, twice the size of the Qutb. 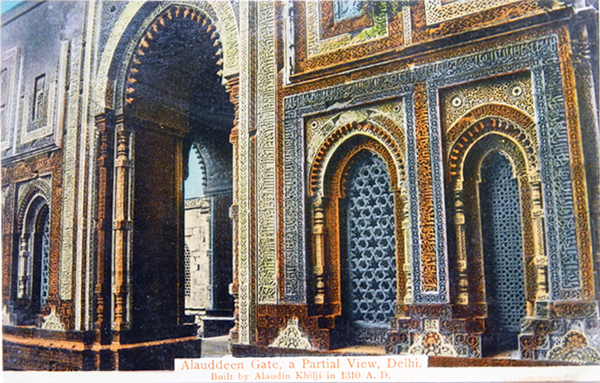 His death left things unfinished but his one completed gateway – the beautiful ‘Ala'i Darwaza – still stands and is one of the most stunning examples of external polychromatic decoration in the world. View of Chandni Chowk, the main throughfare running from the Red Fort into Shahjahanabad. Originally with a central canal, it was significantly altered by the British after 1857. 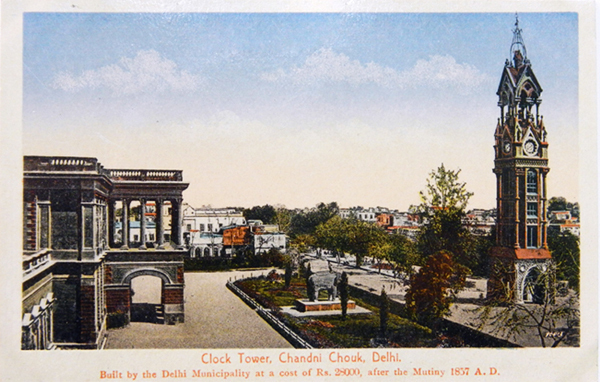 This view shows the Municipal Clock Tower, which was demolished in the 1960s. The busy markets and streets behind the Jama Masjid. The view includes tiny everyday details such as a charpoy or string cot laid on a roof at bottom right. A closer view of the superlative craftsmanship of the 'Ala'i Darwaza, the only completed portion of 'Ala'-ud-Din Khalji's ambitious plans to enlarge the Qutb Minar complex. 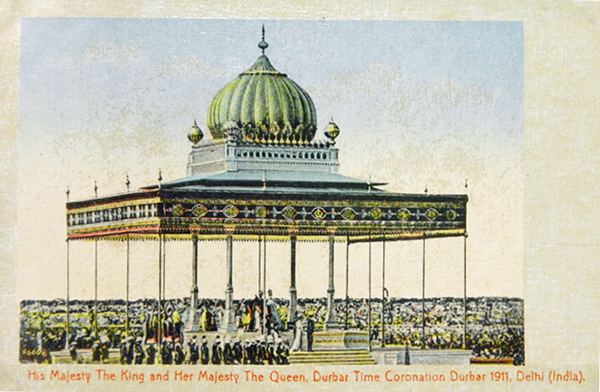 The Imperial Durbar of 1911 was an occasion for the British to proclaim their pre-eminence. 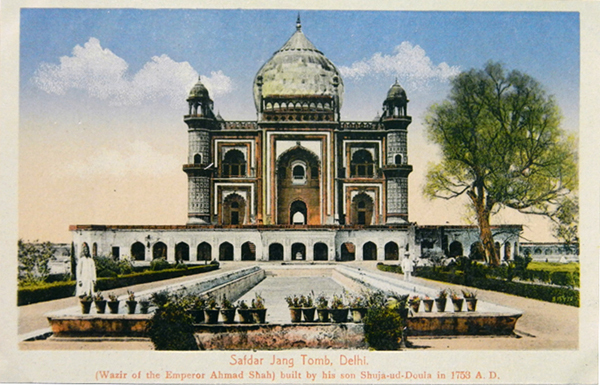 Interestingly, not only did they use borrowed techniques (the concept of a durbar itself), but they also held their Durbars in Delhi, until then the last Imperial capital of India and far from their own at Calcutta. 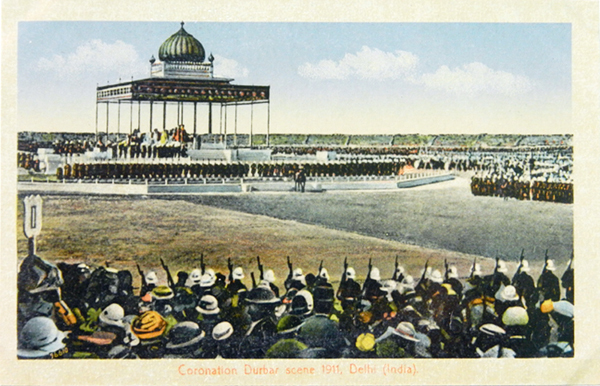 The last of three such events (earlier Durbars were in 1877 and 1903), each grander than the previous, the Imperial Durbar of 1911 was a spectacular event - one of the rare occasions when most of the ruling Princes of India were in attendance together - held on a vast open plain used for all three Durbars, and now known as Coronation Park. 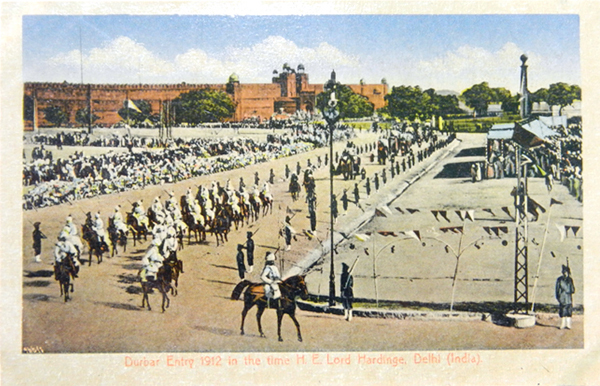 The participants entered the Durbar on magnificiently caparisoned horses and elephants with the route thronged by cheering crowds waiting to see the Emperor and Empress. 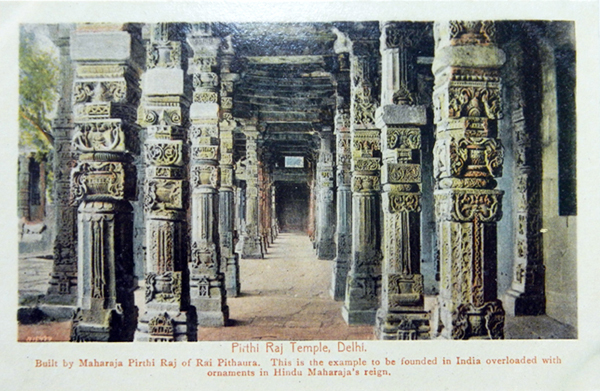 View of the 'Homage Pavilion' where the King and Queen were seated and greeted by their princely subjects - each of the Indian rulers was expected to approach them, bow, retrace their steps, and only then turn back to return to their seat. The Maharaja of Baroda famously ignored the carefully-choreographed protocol and turned his back on them after a perfunctory bow, resulting in a huge diplomatic row. Another view of the entry processions. 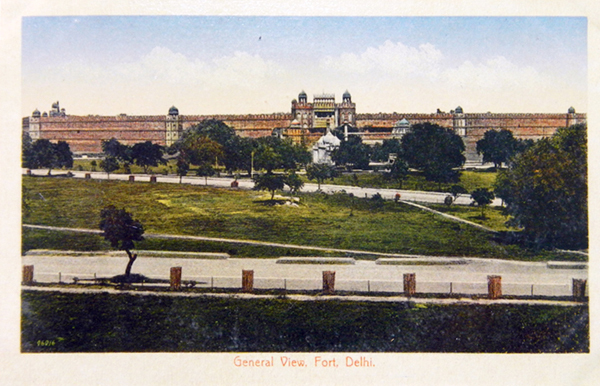 The route passed by the ramparts of the Red Fort (seen here in the distance) almost as a salute to the British Empire's predecessors, the Mughals. A small delightful mosque on Chandni Chowk named for its golden-coloured domes, it is best known for a rather gruesome episode of history - it was from the courtyard of this mosque that Nadir Shah ordered the massacre and looting of Delhi in 1739. He is in fact reported to have lingered to witness the proceedings from there. 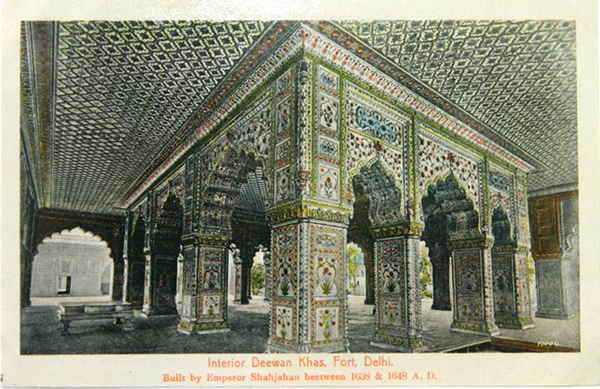 The spectacular interior of the Diwan-i-Khas (Hall of Private Audience) which was nevertheless a pale shadow of itself by the time this photograph was taken, and the postcard printed. In the aftermath of the 1857 mutiny/ war, it was used as a mess for British officers. 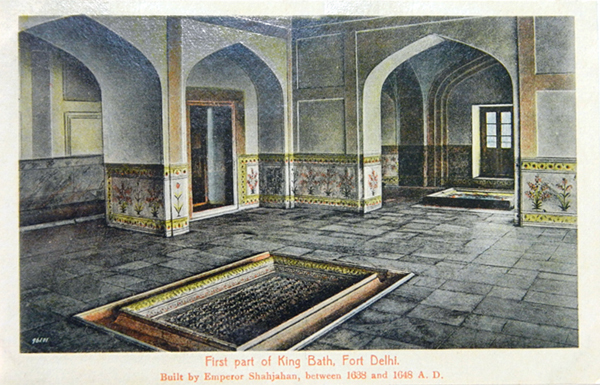 A chamber in the hammam (Turkish bath) within the private apartments of the Red Fort, opposite the Pearl Mosque. It has long been closed to the public. 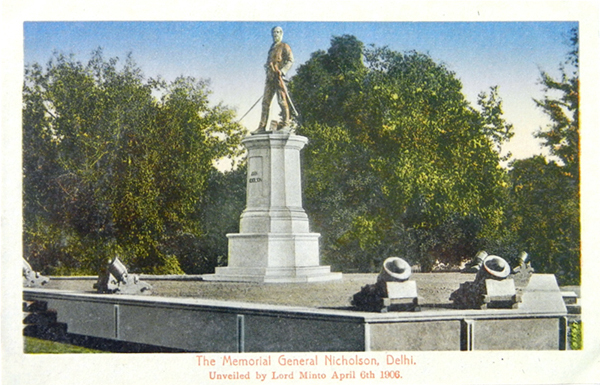 The Victorian 'Hero of Delhi', General Nicholson planned and executed the capture of Delhi by British forces in 1857. His statue was taken down in the 1960s and later moved and erected in front of his old school, the Royal School Dunagon. Another view of the Qutb Minar in its environs. The 'Ala'i Darwaza is visible in the foreground, and the tops of the arches of the screen enclosing the mosque courtyard towards the rear left. 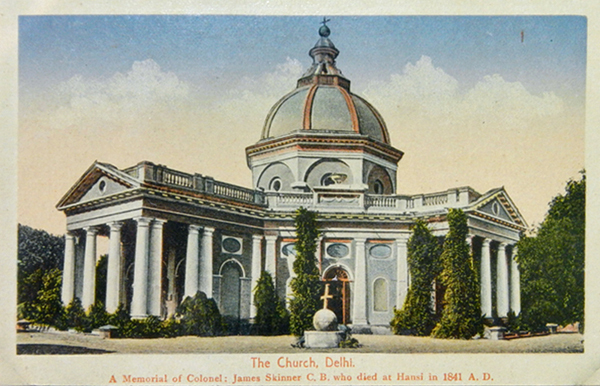 One of the oldest churches in Delhi, St. James' Church was built by the extraordinary Col. James Skinner, the Anglo-Indian military adventurer best known for the cavalry regiments he raised for the British (and which are still part of the Indian Army). He commissioned the church to keep a vow he made while lying wounded on the battlefield at Uniara in 1800. 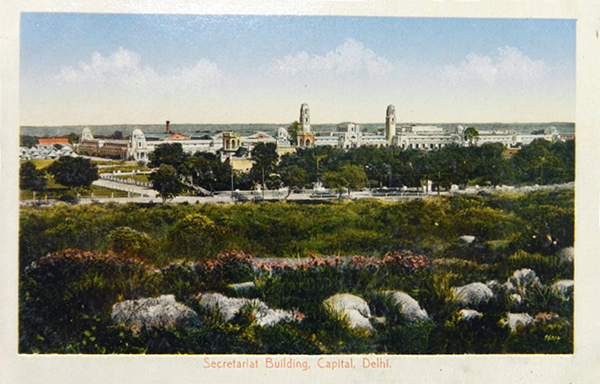 An unusual panoramic view is of the temporary Secretariat buildings in Civil Lines, used before the Herbert Baker-designed buildings were constructed on Raisina Hill. They are now used by the Government of Delhi. 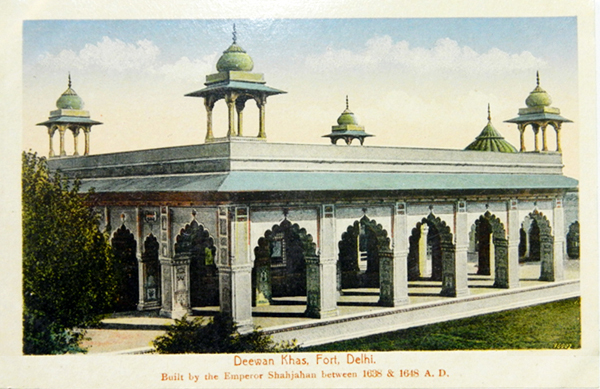 A view of the colonnades of the Diwan-e-Am (Hall of Public Audience). When a durbar was in session, the beautiful though clinical precision of the interiors would have been softened by luxurious textiles covering the walls and floor. The space immediately in front of the marble throne (seen elsewhere in this exhibition) would have also been segregated by gold and silver railings for the different classes of courtiers. 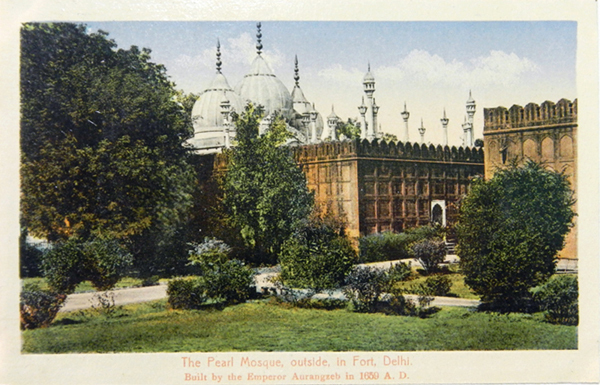 A view of the exterior of the Pearl Mosque, a tiny addition to the Red Fort by the Emperor Aurangzeb, for his personal use, as well as by the ladies of the harem. The prayer-hall of the mosque is inlaid with outlines of musallas (small carpets for prayers) in black marble, and it stands at a higher level than the courtyard. 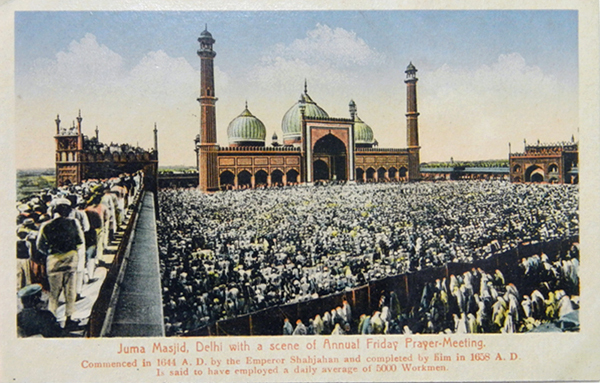 The courtyard of the Jama Masjid at its busiest, during prayer. The largest mosque in India and among the largest in the world, it was built to accommodate the entire Muslim population of Delhi and can fit up to 25,000 people at one time. 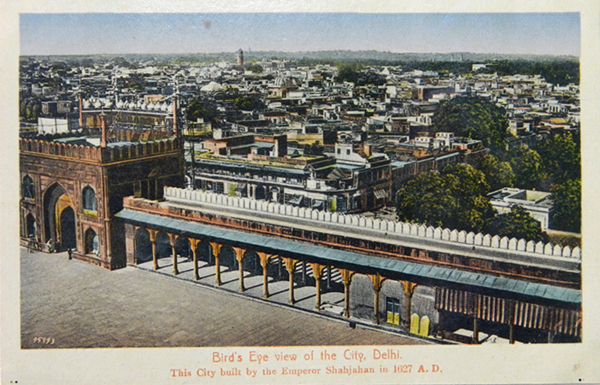 A view of Shahjahanabad, built between 1638 and 1649 and enclosing nearly 1,500 acres of land, with the Red Fort and the Jama Masjid - from where the original photograph for this postcard was taken - as the twin focal points. 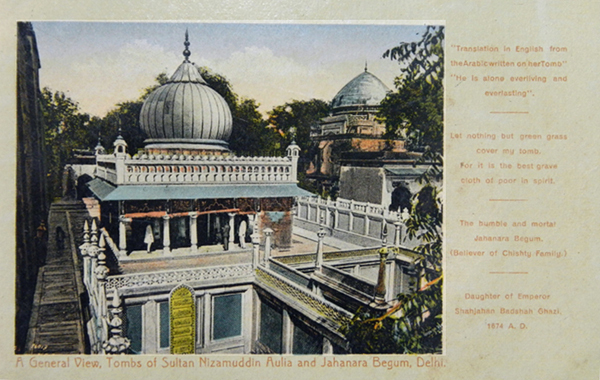 Nizamuddin Auliya was one of the best-known Sufi saints of Delhi, and a member of the Chishti order. His dargah became the centre of an eponymous settlement, which he helped develop, initially as a resting spot for travellers. His many followers included Jahanara Begum, Shah Jahan's favourite daugher, who wrote a biography of Moinuddin Chishti, the founder of the Chishtiyah order, titled Mu'nis al-Arwah. Image courtesy the Pictorial Archives of the Maharanas of Mewar. © MMCF. 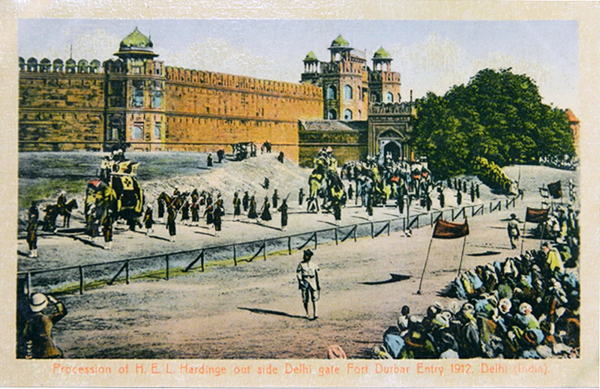 The Lahore Gate of the Red Fort, Delhi, one of two main entrances. 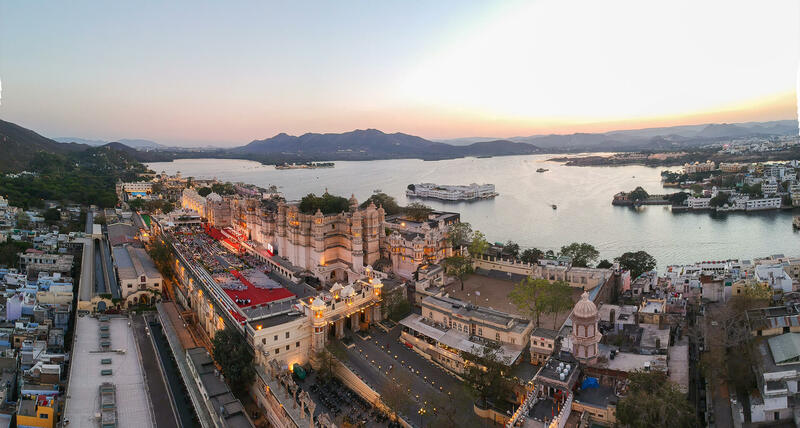 It leads to a covered market called Chatta Chowk and further inward, to the Hall of Public Audience, and then the private apartments of the Mughal Emperor. The barbican in front of the gate was added by the ruthlessly practical Aurangzeb; it is said his father rued the ruined beauty of his gate, remarking that it was like veiling the face of a beautiful woman. Built for Safdar Jang, who served as Emperor Muhammad Shah's Prime Minister, the tomb is constructed in the late Mughal style with parallels to other Mughal tombs like Humayun's or the Taj clearly noticeable. 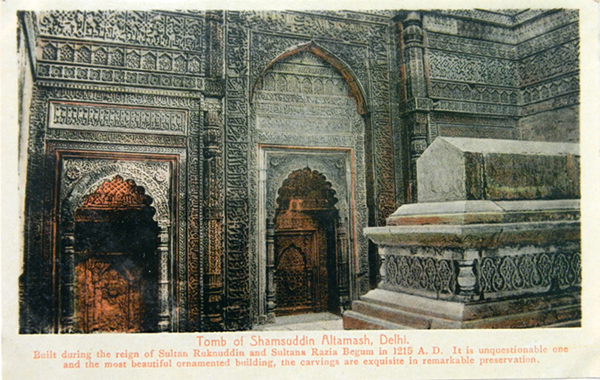 The marble for the tomb was recycled from older buildings, a common practice at the time for expensive building materials. Situated within the Qutb complex, the tomb of Iltultmish is exquisitely carved and preserved despite it being open to the sky. The original dome has collapsed, but the open nature of the tomb is ironically more in keeping with the tenets of the Quran, which recommends unostentatious burials, open to the elements.